There are numerous ways to feature content on your website or blog. Below is a list of nine of the best ways to show off stats about your business or engage your audience. Think we missed one? Let us know in the comments below! Timelines can be delivered in the form of an infoposter or through using this handy timeline creation tool (shout out to Kane Jamison for sharing some great tools to visualize data content). While this medium works best for chronological events, timelines aren’t limited to charting historical bullet points. You can use them to track unfolding events or mention the top defining moments of your industry. Video is an engaging way to interact with your audience. It provides a quick way to reach out to customers, whether you produce how-to videos or company updates. A prime example of weekly web videos is Moz’s Whiteboard Friday series. They’re informative, quick, and entertaining. If your company produces videos, they should be easily accessible on your site, as well as on your branded YouTube or Vimeo channel. Take advantage of positive customer reviews or your most popular products by creating a word cloud based on that data. Online programs like Wordle help you build your own word cloud. One word of caution, however: word clouds can very quickly make information look jumbled, so be selective on what data you use. However, for a handful of data such as reviews, products, places, etc., word clouds are an engaging medium. A photo speaks a thousand words, and using photos or even creating a photo journal can engage your audience and mix up your content. Flickr allows you to create slideshows from your photo albums on their website and embed them on your own site. This is a great way to share insights into your company or explain a process through pictures. I included illustrations in this list because, although they’re not as useful for conveying large chunks of information, they can help direct your audience around your site. Much like using photos to quickly communicate different aspects about your company, placing illustrations throughout your website – whether for visual appeal, to complement a page topic, or support a point on your site – will help break up text-heavy segments and add some color and aesthetics to your brand. Illustrations can be drawings that partner with different sections of your site, mapping a navigation path or cartoon avatars of your staff. Easy to create and simple to understand, minigraphics summarize stats at the end of a paragraph or next to a bullet list of reports. They can be placed directly on your webpage and add some color to an article or page. 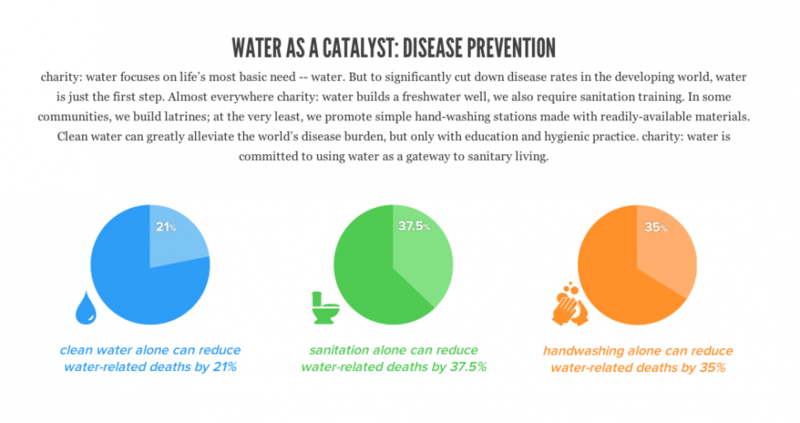 A perfect example is global non-profit Charity: Water’s Why Water? page. Google has a tool for building charts and graphs that you then can use on your own site. Ideal for explaining a process or sorting out the needs of a consumer, flow charts can provide great visuals to direct your audience to a certain conclusion. Gliffy has a handful of examples of engaging flowcharts and is a helpful tool, but you can also create simple flow charts in Adobe Illustrator or Microsoft PowerPoint. 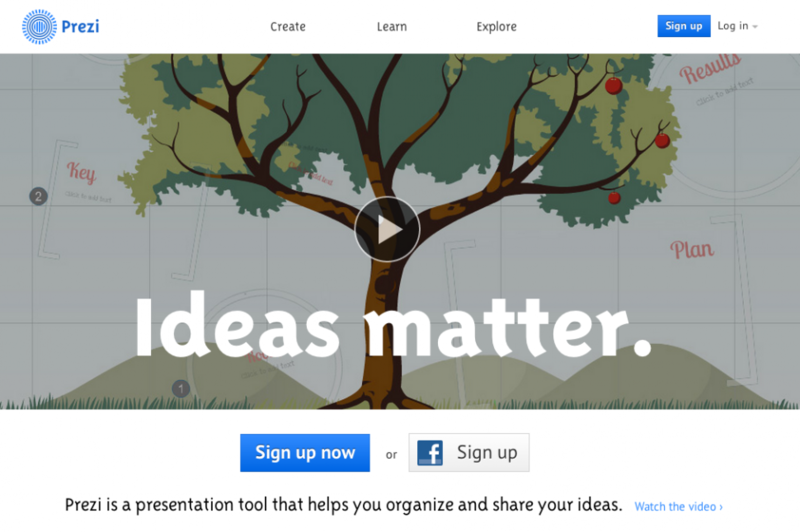 Prezi is an online tool that creates an alternative presentation layout to the popular slide-by-slide method of PowerPoint. It creates presentations as if on one page and can zoom in and out displaying key points. There are a handful of presentation templates, plus the option to create your own from scratch. Once you’ve created your free presentation, you can link to it on Prezi or embed it on your webpage or blog. And there you have it! Nine awesome ways you can engage your audience and display content. What’s number 10? Tell us in the comments and we’ll add it to this post! Sarah is excited to learn all things SEO in her role as Search Marketing Associate at Wheelhouse Search. New to Seattle, she enjoys exploring the sights when it isn't raining and creating Pinterest-inspired crafts when it is. Find out more in 140 character snippets on Twitter at @Sarah_June12. I really like the Timeline creation tool. (#1). I will have to get a little more creative with some of our websites. Great find Sarah!